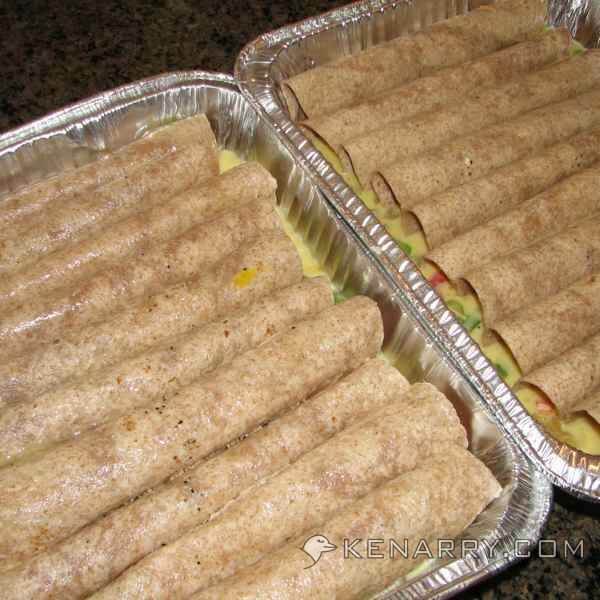 Christmas brunch for your overnight guests will be easier with these festive whole wheat breakfast enchiladas ready to go in the freezer. Want to make Christmas morning a little easier this year? 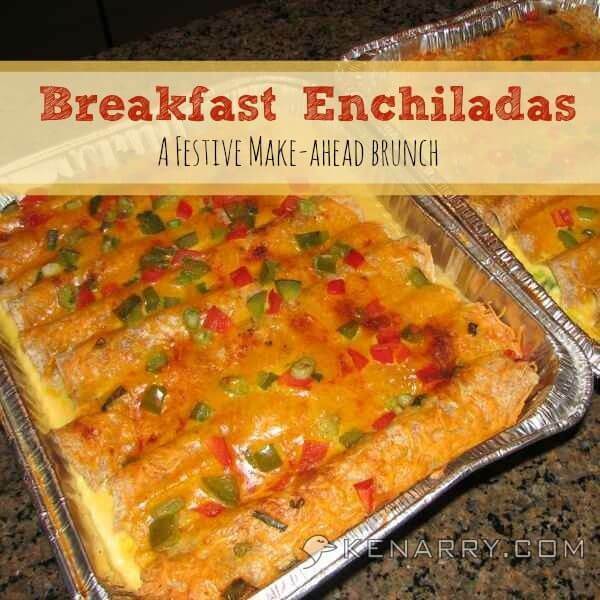 Feed a crowd with these easy breakfast enchiladas that you can make ahead of time. 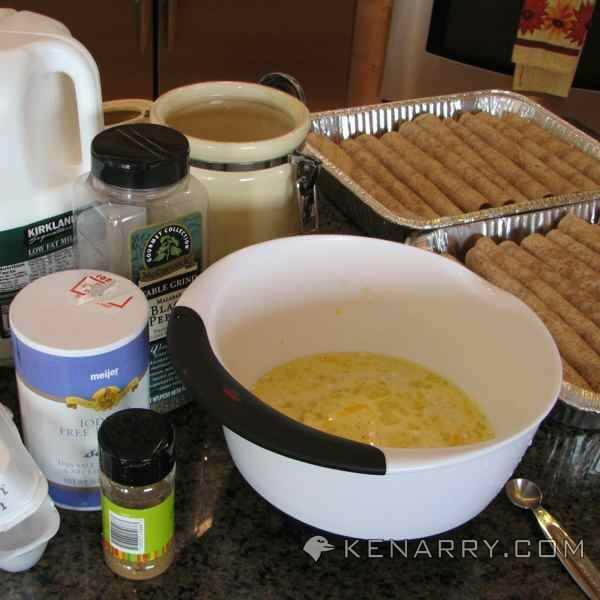 When hosting a large group of overnight guests, I hate spending time fussing over a big breakfast in the morning. I gravitate toward any recipe that can be prepared ahead of time to feed a crowd. 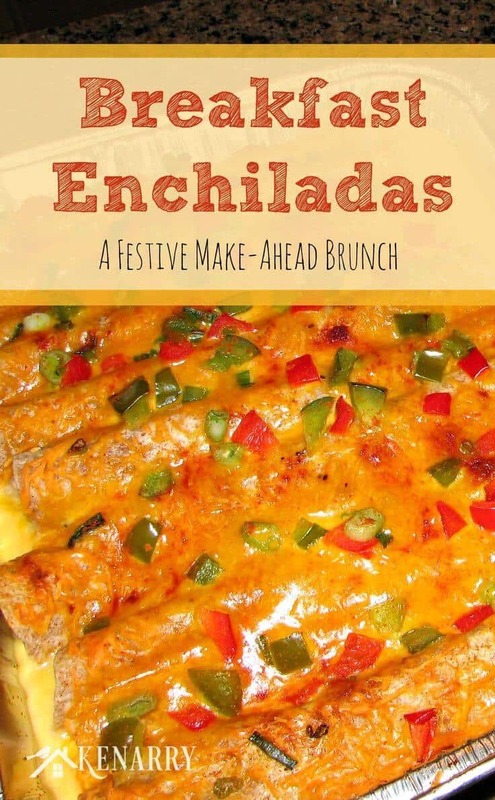 These festive Christmas breakfast enchiladas, adapted from a recipe on Inspired Taste, should be made the night before your holiday brunch — or better yet prepare the breakfast enchiladas a few weeks ahead of time and store them in the freezer! What type of meat is best in breakfast enchiladas? We used ham in our breakfast enchiladas. We liked the slight sweetness and saltiness of it. But you can also use bacon and ground sausage. How do you freeze breakfast enchiladas? One of my favorite things about this recipe is that they can be made ahead, frozen, and baked when you need them. 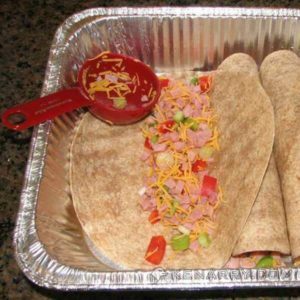 The best way to do this is to prepare them in disposable foil pans (like the ones I used). 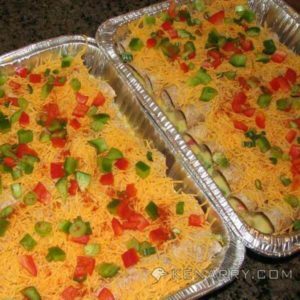 Cover tightly with foil and write the name of the dish and the date on top. They can be frozen for up to 3 months. When you are ready to thaw them, just move them to the refrigerator 24 hours before. Here is a printable recipe card with step-by-step pictures. They are so easy to make that they will soon become your favorite brunch recipe. Prepare the breakfast enchilada filling. 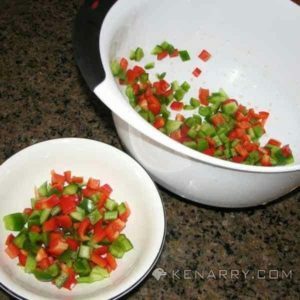 Finely chop the red and green peppers and mix together in a bowl. Set aside 1 cup of the mixed peppers to use as a festive Christmas-colored topping for the enchiladas. Slice the green onions and add to the pepper mix. You can also slice some of the green tops to include a little more green in the Christmas-colored topping. 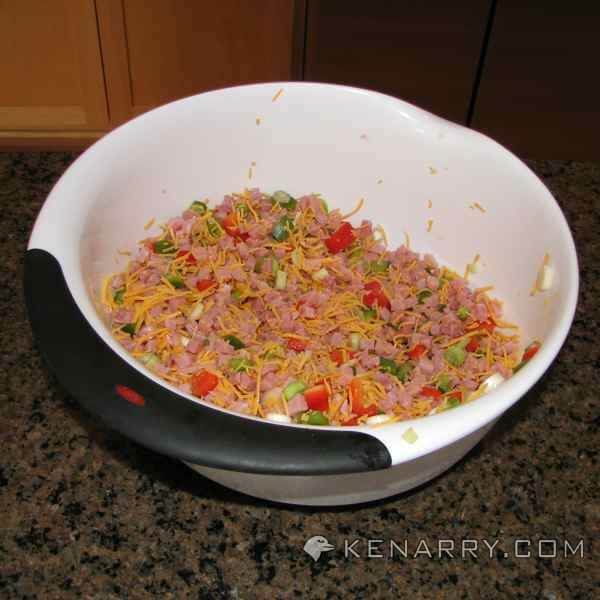 Add ham and 2 cups of the shredded cheese to the bowl. This is your filling for the enchiladas. Mix it well. Fill the breakfast enchiladas. Lightly grease two 9 x 13 glass or aluminum baking dishes. (Tip: Use foil pans to make clean-up a little easier after your Christmas brunch). Place a heaping 1/3 cup of the filling down the center of each whole wheat tortilla. Roll the tortillas. Roll up the tortilla and place seam side down in your baking dish. Make the breakfast enchilada sauce. I found it easier to divide the ingredients in half to make the sauce twice - once for each separate baking dish of enchiladas - so that the sauce could be divided easily between the two pans. Beat the eggs with a whisk or fork. Add milk, flour, salt, black pepper, and cumin and continue to beat until well combined. Pour the sauce into the pan. Pour the egg "sauce" over all of the breakfast enchiladas in the pan so that it's evenly distributed and all of the whole wheat tortillas are wet from the sauce. Serve with salsa, sour cream or your favorite condiments. Enjoy! 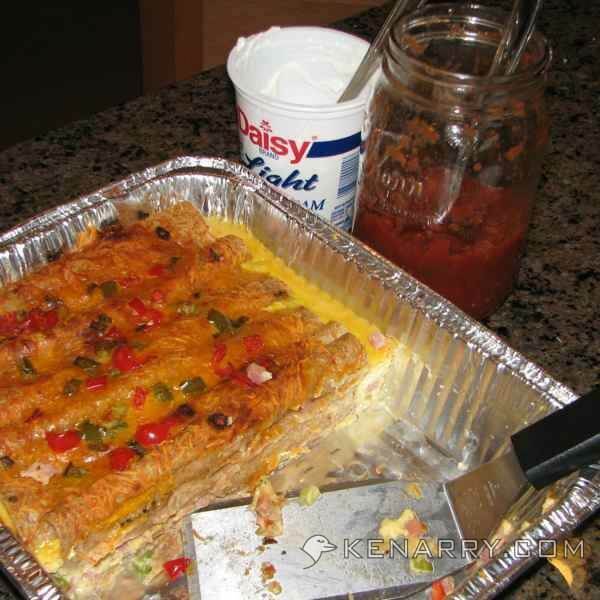 We used ham, peppers and onions in our Christmas breakfast enchiladas, but there are no rules. You could use bacon, sausage or other breakfast meats to give it a different flavor. You could also use other vegetables or experiment with different cheeses, like chopped spinach with feta, mozzarella and tomato. If you try other ingredients, please comment below and let us know how it turned out for you. 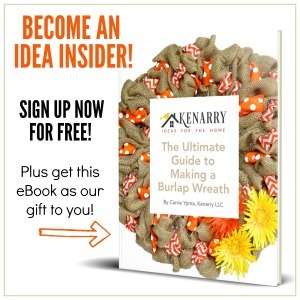 Need more holiday ideas? Follow our Christmas Board on Pinterest. WOW do these look great! I’m always looking for breakfast/brunch ideas. Perfect for a large crowd too 🙂 Thanks for sharing! Hi Joann! We love any breakfast/brunch recipe that you can prepare ahead of time so you don’t have to fuss in the morning. Let us know if you you try it. We think you’ll love it as much as we do. Thanks for swinging by to let me know how the recipe worked out for you, Heidi! Corn tortillas, chicken and cilantro would be so delicious! I’ll have to give that a try sometime. Could I re-heat these on a grill? Looking for breakfast ideas for four race teams! Hmmm… that’s a great question, Debbie. I’ve never done that, but I would imagine if you baked the breakfast enchiladas ahead of time so that the egg was throughly cooked and you were just reheating them, it would probably work okay on the grill. I’d recommend you test it out once before race day just to be sure. 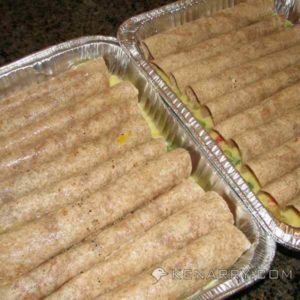 Another option would be to make individual breakfast burritos with scrambled eggs, cooked ham or sausage, onion and other fillings wrapped in tortillas in large aluminum pans. We did that once last summer only we used a smoker instead of a grill to heat them and it worked great. 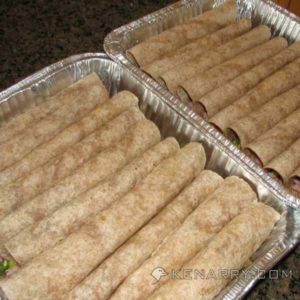 If you wanted it to be an easy grab and go breakfast for the race teams you could wrap each burrito individually in aluminum foil instead. Good luck with race day! Your teams are so lucky to have someone making a special effort so they’ll eat well!